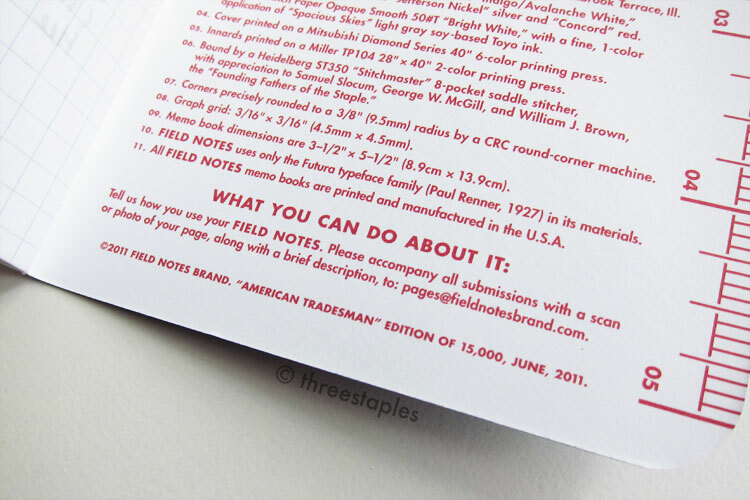 American Tradesman is not one of my top favorites among Field Notes COLORS memo books (see how it ranks in my ranking page). In fact, I used them all up and don’t have any blank ones left for posterity. I used them up for daily and travel journaling, and for that purpose, they performed perfectly fine. What I don’t like about this edition is the texture of the cover stock. I just think it’s “meh.” That’s the most negative thing I can say it. I like the silver text against the blue, and how the inside cover is a different color from the outside with the contrasting red text. The color scheme is definitely appropriate for a summer release, too. It’s just that there are other editions that I have stronger attraction to, that this one just pales in comparison. Many earlier editions came with something extra (Packet of Sunshine, County Fair, Balsam Fir) but what’s unique about this edition is that it came with a carpenter pencil, labeled FN-13. It even came with a reference card (labeled FN/RC No. 001 and packaged in a clear zip-lock bag) that instructs you on how to sharpen the pencil. “Always cut away from yourself!” This reminds me of the time I badly cut my finger trying to sharpen a pencil with a knife. I must have been in 2nd grade or something, and to this day, I don’t understand why I was trying to use a knife. It’s not like I didn’t have a pencil sharpener then. I don’t really have a use for the carpenter pencil but I sharpened it as you can see. I guess I just like sharpening things?!? Word on the street is that Field Notes ran out of the red carpenter pencils, so they had to substitute them with white carpenter pencils later on. White looks good too! At some point, black ones were also made (see An Obsessive’s Guide to Field Notes: Part Three video) but I do not see them in the online shop at this time. Remember, these later-released, black/white and red/white pencils are not labeled “American Tradesman Edition”; they are labeled as “All-purpose carpenter pencil.” Check out this blog post by The Write Obsessions for all three colors together! And how about these orange and yellow ones by Aaron Draplin himself, way back in 2008? Sweet. American Tradesman (Summer 2011) is the 11th edition in the COLORS series. Edition size: 15,000 books were printed in June 2011. Extras for subscribers and retail: one carpenter pencil “FN-13” in red/white or white/red with text “American Tradesman Edition” and either “Colors Edition” or “Measure Twice” on the left. A reference card FN/RC No. 001 was also included. Interestingly, the “Practical Applications” on the back cover are the same as the ones you find in the original kraft brown memo books. I think Field Notes have raised my expectations too high over the years that I find this a bit disappointing. Woe is me. County Fair is the first COLORS edition to use Neenah Paper for its covers; previous editions were all French Paper. You can tell the paper is different because it’s linen-textured and slightly stiffer. It was also the first time they printed colors on white cover stock to achieve the three different colors: blue, red and yellow. This release had 50 different versions, representing all 50 states of the good ol’ US of America. The front cover is labeled with the state’s name and logo, and the back cover is full of facts and figures specific to that state. Holy… Can you imagine the amount of research that went into this? Talk about labor of love! The white belly band is designed differently from the previous COLORS, too. Centered on the band is a handsome “Great Seal of Field Notes Brand.” Such attention to detail. Amaze. This is also the first COLORS edition to join the “regular” line of products (perhaps this explains the item number FN-01a?). At the time of writing, you can still buy individual states online. The box set of all 50 states are still available online, too. It comes with a blue “First Place” Ribbon. I’m very tempted, folks. I saw the box set at a local store, and I was *this* close to getting it. County Fair was first released in summer 2010 and is the 7th edition in the COLORS series. Edition size: So complicated. That’s exactly what FN says. First printing in June 2010. Cover paper: Neenah Sundance Linen 100#C “Chicken Egg” printed with “Bluejay” blue, “Cardinal” red, and “Yellowhammer” yellow inks. “Practical Applications” on the back inside cover are the same across all three colors, and in all states. Extras for subscribers: First Place Blue Ribbon with the same seal featured on the belly band. I have the third printing, printed in February 2012, so the specs you see may be different. For the love of god though, please don’t read the small text on the red books too closely. I don’t know about you but that gold text against the orange-red really hurts my eyes!